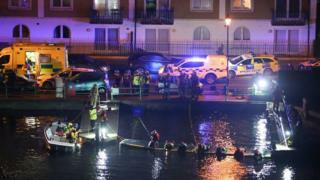 An "intensive" search and rescue operation was launched after two men were seen in the water at Brighton Marina. HM Coastguard said a man was reported to have left a home nearby and entered the water at 00:30 GMT. A friend followed him into the water but got out, the coastguard confirmed. The other person is still missing. The RNLI helped with the overnight search and the coastguard scrambled its helicopter. Sussex Police and East Sussex Fire and Rescue also assisted in the search effort, which has now been called off. "Despite an intensive search of the marina, nothing has been found," the coastguard said.